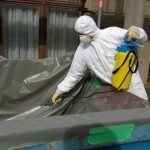 Many ACT businesses could potentially contain ‘’fluffy’’ asbestos unbeknownst to them. This is allegedly because these buildings were “out of the scope “of a $100 million effort to remove asbestos in the 1980s. According to reports, approximately 50 families in the Queanbeyan region have continued to live unaware of the dangerous toxic fibres hanging above them. Fluffy fibres are more dangerous than the asbestos commonly found in the walls or wrapped around pipes.Exposure caused by a single removed or broken roof tile is enough to be deadly.A former ACT Asbestos Removal Program general manager has stated that commercial properties throughout the Canberra region could contain the fibrous form of asbestos since the homes were outside of the clean up region. The bill to clean up the asbestos could cost anywhere up to $100,000. The council told them to just ‘tape up” their vents for safety. The Government has yet to take up responsibility for the terrible safety measures given out with regards to the Asbestos Awareness and removal.